Cuba "sonic attacks" – a covert accident? The purported "sonic attacks" that sickened U.S. and Canadian government workers in Cuba last year could have been an accidental side effect of attempted eavesdropping, says a University of Michigan engineering researcher who reverse-engineered the attacks in a lab. Kevin Fu, an associate professor of computer science and engineering, and a team showed how ultrasonic signals – outside the range of human hearing – can combine to produce audible and potentially dangerous tones similar to the undulating, high-pitched chirping that the diplomats described. "We've demonstrated a scenario in which the harm might have been unintentional, a byproduct of a poorly engineered ultrasonic transmitter that was meant to be covert," Fu said. "A malfunctioning device that was supposed to inaudibly steal information or eavesdrop on conversation with ultrasonic transmission seems more plausible than a sonic weapon. That said, our results do not rule out other potential causes." Beginning in December 2016, at least two dozen U.S. and Canadian personnel in the nations' Havana embassies suffered nausea, ear pain, hearing loss, nosebleeds, vertigo and even trouble walking, according to news reports. Doctors described the injuries as "mild traumatic brain injury" and "a concussion without a concussion." At the onset of their illnesses, they reported hearing concentrated, high-pitched chirping noises. While some experts hypothesized sonic attacks, others pointed to poisoning or a virus. A malfunctioning device that was supposed to inaudibly steal information or eavesdrop on conversation with ultrasonic transmission seems more plausible than a sonic weapon. Ultrasound itself hasn't been known to harm humans except with exceptionally extreme intensity, but ultrasound can produce audible byproducts capable of harm. When ultrasonic signals containing multiple tones interfere with each other through a phenomenon called intermodulation distortion, audible sound can result. Intermodulation distortion can down-convert the frequency of ultrasound into the audible range – resulting in high-pitched noises, Fu said. A pattern Fu and his colleagues noticed in the acoustic spectral plots in the AP news video suggested that intermodulation distortion might be at work. They set out to simulate the phenomenon between multiple ultrasonic signals. Using ultrasound, they were able to generate similar "metallic chirping sounds" at 7 kHz with ripples spaced evenly at 180 Hz, mimicking the arrangement in the AP video. How can inaudible ultrasonic signals lead to audible byproducts? A University of Michigan team demonstrates. The researchers generated ultrasound using two ultrasonic emitters – a 25 kHz tone combined with a 180 Hz tone modulated on a 32 kHz carrier. The method is similar to the concept AM radio, but the researchers used ultrasound instead of radio waves. Think of 32 kHz as the station's frequency. When the 25 kHz tone interferes with the transmission, audible sound at 7 kHz results. 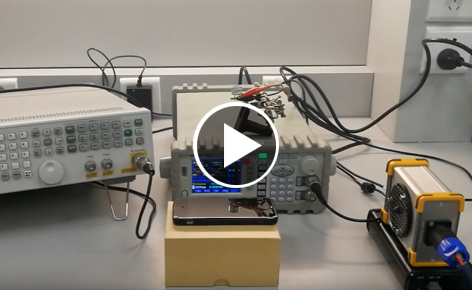 The researchers also built a proof of concept device to simulate covert eavesdropping by playing a song instead of the 180 Hz tone over the 32 kHz ultrasonic carrier. Ultrasound emitters are all around us. They can take the form of room occupancy sensors in energy-efficient buildings, rodent repelling devices, burglar alarms, security cameras, HVAC system vibrations.